It’s 1605 and a penniless playwright, William “Shagspeare,” is commissioned to abandon his play, “Macbeth,” in favor of a propaganda-esque account of the Gunpowder Plot. Also known as the Guy Fawkes Treason, the Gunpowder Plot was the failed assassination attempt of King James I of England. 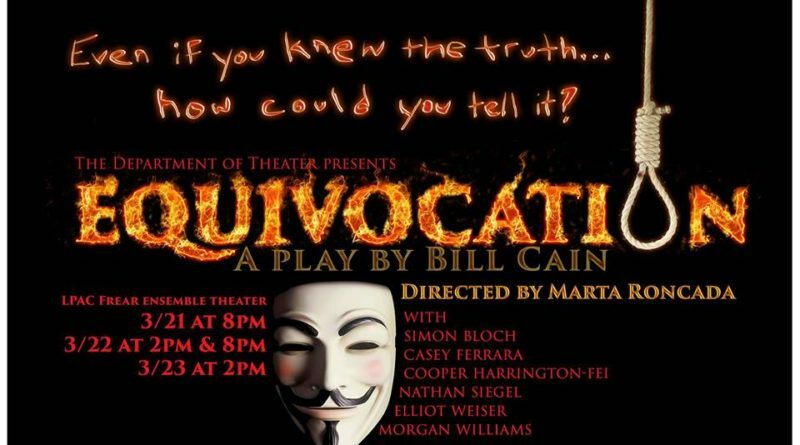 This political moment forms the volatile background behind the action of “Equivocation,” written by Bill Cain and directed by Marta Cortez-Roncada ’14. “Equivocation,” which showed in the Frear last weekend, begins with the king’s malevolent and vaguely slimy right hand man, Robert Cecil (Morgan Williams ’14) convincing our playwright to adopt a genre he tends to stray away from: current events. For Shagspeare (Elliot Weiser ’14), known as “Shags” to his friends, the Gunpowder Plot offers an opportunity to investigate terrorist conspiracies and religious crises in the government. Cecil, however, wants otherwise, and expects a play favorable to the king’s image. The play’s narrative works to highlight the the tension between truth and fiction, between politics and art, between pragmatism and creativity. “Truth defies dramatic formula,” declares Shags, as he tries to explore this tension by interviewing Thomas Wintour, one of the accused in the conspiracy. Faced with scenes of torture and cruelty, the Bard has to find a way of occupying a middle ground between truth and propaganda, a way to “equivocate,” or use words with a view to mislead without explicitly lying in his play. 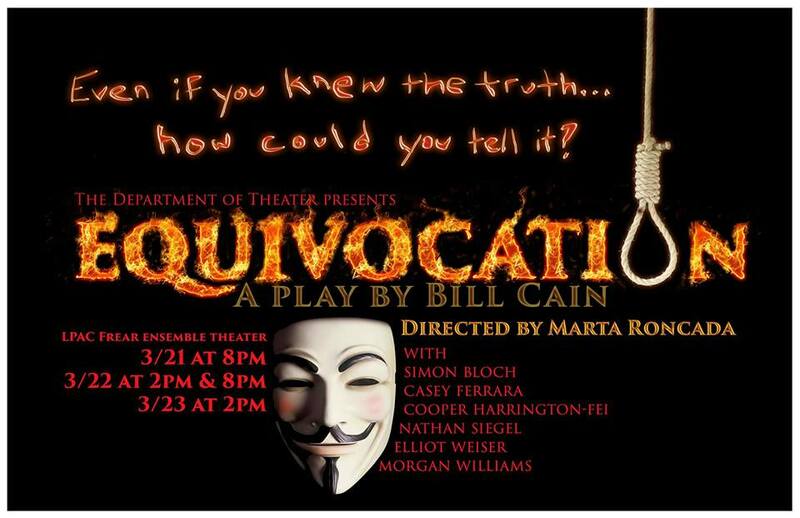 “Equivocation” is an interesting piece of historical fiction that is also filled with humor. Most of the humor stems from the script’s ability to target audience members who are familiar with Shakespeare’s work. A particularly amusing moment stands out at the start of the play, when Cecil tells our playwright: “You’ve killed more kings than any man alive, your brain is a graveyard for royalty.” Cain builds admirably upon what we know of Shagspeare’s character, elaborating on his relationship with his daughter, Judith (Casey Ferrara ‘14) as well as the ghost of his dead son. We are also confronted by powerful moments that reveal the religious and political turmoil of the time. “Equivocation” makes us think about art’s ability to both be caught up in these disruptions, as well as its capacity to stand apart and question events. Yet, it often feels like the play glosses over this commentary, probing into important issues without fully attempting to engage or resolve them. Nonetheless, we grow increasingly more aware of the complexity of the politics of the play as we we are oriented to the dynamic between King James (Simon Bloch ’17) and Cecil. We are also introduced to Father Garnet (Cooper Harrington-Fei ’17), a Jesuit priest who, as the real master of equivocation, presents some important religious commentary. The cast of the play was small but exceptionally strong. Williams played a decisive and ingenious Cecil, and Weiser made Shagspeare’s personal doubt both obvious and extremely powerful. Ferrara’s Judith came across as both smart and angry, a result of her strained relationship with a cold and unfriendly father. Simon Bloch and Nathan Siegel ’15 played members of Shagspeare’s troupe at the Globe Theatre, and their quick dialogues and deft exchanges provided a good opposition to the Bard’s questionable authority. All in all, “Equivocation” was a deeply intelligent and enjoyable show, a unique hybrid of Shakespearean drama and sharp historical fiction.